but we make a life by what we give"
people, then feed just one"
we can conquer childhood hunger"
ISKCON Food Relief Foundation under the brand name “Annamrita” carries out the mid-day meal programme and provides nutritious food to school children. Formed in April 23, 2004 under the Bombay Public Trusts Act (1950), Annamrita believes in providing children with the right nutrition to support their education. The mid-day meal project carried out by IFRF, Haryana serves Satvik Food-Blessed Food to the children which helps the child to grow based on that nutrition, makes him healthier, stronger, brighter and more determined in their life. Annamrita wishes to impart moral values by the medium of food and always look forward to active participation and support to help achieve the greater heights in the endeavour of providing nutritious food to school children. ISKCON Food Relief Foundation under the brand name “Annamrita” carries out the mid-day meal programme and provides nutritious food to school children. Formed in April 23, 2004 under the Bombay Public Trusts Act (1950), Read more. Shyam, a 9-year old boy is a fruit vendor’s son. He loves to go to school and play with his friends. But unfortunately, due to the seasonal business of fruit-selling, he could only study for 5 months in a year and work for the rest. He and his friends like to read stories and often go to their village master for hearing different interesting stories. His family of four – Shyam, his sister, mother and father, had to move from one place to another from time to time. Always changing schools and saying goodbye to his old Read more. 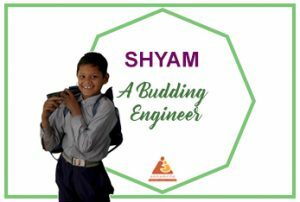 Shyam, a 9-year old boy is a fruit vendor’s son. He loves to go to school and play with his friends. But unfortunately, due to the seasonal business of fruit-selling, he could only study for 5 months in a year and work for the rest. He and his friends like to read stories and often go to their village master for hearing different interesting stories. Read more.